The very great value of proper posture cannot be too strongly emphasized. Man is the only animal that walks erect. He is the only animal in whom old age brings a forward bending of the spine. The hanging head, which is the attitude of hopelessness, and which is caused to a very large extent by the mental attitude that goes with approaching old age, no doubt does a great deal to quicken physical decline. Therefore it would be wise to remember the very grave importance of a straight, erect spine. Each day of your life should be to a certain extent a fight for the best that there is in life and a struggle to hold the spine as nearly erect as possible. If you are sitting in a chair, sit up straight, head back, chin in. If you are walking or standing, the same rule should apply. The more nearly you can assume the position which is sometimes criticized by the sarcastic statement that "He looks as though he had swallowed a poker," the more nearly you will approximate the ideal position. As will be shown in the succeeding chapter, it is not necessary to make extraordinary efforts to hold the shoulders back or to arch the chest. The one idea-chin in, down and backward-will accomplish all that is needed. The chest and shoulders will naturally take care of themselves. Additionally, it's good to remember that, because of the mind - body connection, attitude itself has a tremendous influence on both the physical and mental organism. The mind, for instance, is affected to an extraordinary degree by good posture, just as a positive attitude can affect posture positively. Good posture quickens the brain, helps to clear it of "cobwebs" and unquestionably adds to one's feelings of confidence and self-esteem. A fearful man slumps his shoulders and hangs his head. One who is void of fear holds his head erect, "looks the world in the eye!" It is a common conclusion, that if a man without fear were to assume the position of fear, with hanging head and shrinking body, he would quickly find himself stirred by the emotions associated with such a posture. He would soon begin to feel scared! In fact, the attitude of the body has so much to do with one's mental and emotional state that the question of self-confidence or lack of confidence may often be decided simply by throwing your head up and back and assuming the general bodily posture that goes with confidence. Good posture not only expresses confidence: it also develops confidence. There is a great truth here that psychologists and those who write books on "character building", have not sufficiently understood or emphasized. When you feel discouraged, the best way to overcome the sense of depression is to "brace up" physically. It will help you to "brace up" mentally. Try it. Then there are the definite physiological results of maintaining an erect spine. The mechanical arrangement of the spine itself is such that if it is held erect the important nerves that radiate to all parts of the body from this central "bureau" are able more perfectly to perform their functions. Where there is pressure on these nerves there is bound to be imperfect functioning. The affected organ will work lazily, indifferently. In fact, the entire science of the osteopaths and chiropractors is based almost wholly upon the value of spinal stimulation and the remedying of spinal defects. There is another way in which an erect carriage has a direct physical influence, namely, in maintaining the proper position of the vital organs. When the body is held erect the chest is full, round and somewhat expanded, affording plenty of room for the heart and lungs. This, in itself, is conducive to vitality as compared with the flat- chested attitude. The stomach, liver, spleen, pancreas and intestines all tend to drop or sag below their normal position when the body bends forward. In maintaining an erect position all these organs are drawn upward and held in their natural position, and this means greater vigor and better functioning on the part of each. This particular consideration is of special importance in the case of women. It all goes to show the truly wonderful value of maintaining the spine in a properly erect attitude. The sitting position usually assumed is far from what it should be in order to insure health. As a rule, we sit humped forward, with a decided bend in the spine, ultimately developing splendid examples of what we call round shoulders. The spine, while sitting, should be held as nearly straight as possible. The position of the head, to a very large extent, determines the general posture of the body. As nearly as possible the chin should be held inward, downward and backward. I will admit that this position is almost impossible when one is using the ordinary type of chair. An extraordinary effort is required to sit properly in the conventional chair. Furniture of this sort should be made to fit the body in the same way as our clothing does. The back of a chair should be made to fit the backs of those who are to occupy the chair. The chair-back should, at least to a reasonable extent, approximate the normal shape of the spine. If the chair, throughout its entire back, cannot be thus shaped, then it should be cut off even with the waist line of the occupant. Such a low-back chair will usually allow one to sit erect without serious discomfort. There has been much criticism of American men on the ground that they are inclined to sit down on the small of the back. They slide forward in the chair, with the back bent over and the shoulders humped forward. But the fault really lies with the construction of the chair. The back of a chair does not fit the human back, and the seat is not at the right angle to rest the body. Why is it that men commonly like to tilt a chair backward on the hind legs? Even when they do not place their feet on a convenient table they are prone to tip the chair back and partly balance it on the hind legs. Why do people instinctively prefer a rocking chair as a source of comfort, even when they do not rock? The fact is that it is not the rocking that makes a rocking chair comfortable, but the position of the seat of the chair, with its downward slope toward the back. The rocking chair is comfortable for just the same reason that the ordinary dining chair is made more comfortable when a man tilts it back upon its hind legs. The reason is that in this position one does not tend to slide forward off the chair, the weight of the body naturally carrying the hips to the back of the chair, where it is supported naturally. In order to avoid the "sliding down the cellar door" character of the conventional chair a change should be made in the incline of the seat similar to that found in the ordinary rocking chair and in the chair when tipped back in the manner I have described. The photograph which has been reproduced on the preceding page illustrates the point I wish to make. In this particular instance I have used an ordinary chair to show what can be done to improve the chairs in the ordinary home. Both of the back legs of this chair were sawed off some three or four inches-thus elevating the front part of the chair and lowering the back part, giving the seat an incline toward the rear which more comfortably accommodates the body. This position approximates that of the ordinary swivel desk chair tilted back by business men when they are not leaning forward over their desks. This suggestion can be adopted very easily and cheaply in almost any home, for any ordinary chair treated in this manner will be very greatly improved, and far greater comfort will be experienced as a result of the change. Civilized men and women spend such a very large part of the time in a sitting position that the bodily posture when sitting down is a very great factor in the bodily welfare and health. Special thought and study, therefore, should be given the question of the sitting posture. Unfortunately, this particular subject seems to have been ignored absolutely for hundreds of years in the making of our chairs. It is just as harmful to sit all humped over as it is to stand in such a position. The nervous system cannot be maintained at its best unless the spine is held reasonably erect. Whether sitting or standing, therefore, it is important that you should make a never-ending struggle for a straight spine. If the back of the chair in which you sit is not properly made then it is better, in most cases, to ignore the back altogether. Sit slightly forward from the back and maintain an erect position, with the chin held in, downward and backward. In this position you should sit well balanced, as it were. The chest should occupy the same relative position as when standing erect. If you will hold the head in the position I have indicated it will help you to keep the chest and back in the right position. 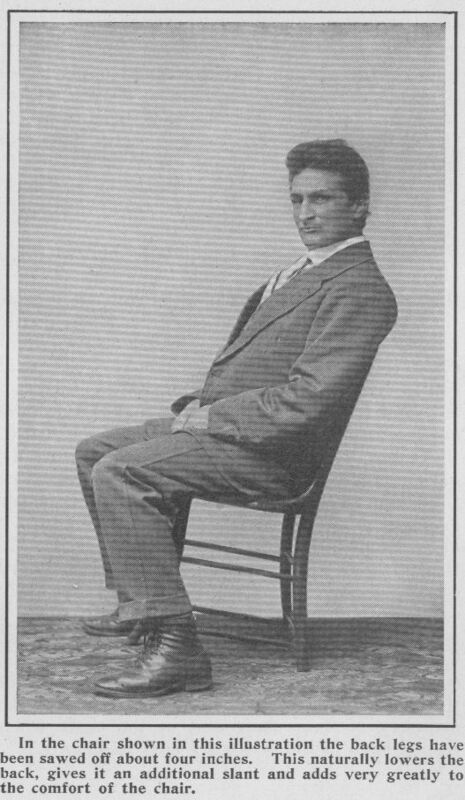 As a general thing, it is a much more simple matter to maintain this erect position when sitting, if either one foot, or both feet, are drawn back under the chair. When both feet are stretched out forward upon the floor a person is inclined to sag backward in a partially reclining position upon the chair. By holding one foot underneath the chair in such a manner that you could rise to a standing position, if desired, without lurching forward, you will find it easy to maintain a well balanced and erect posture. If at any time you find yourself slumping forward or slouching in your seat, it is good to stretch your arms high above the head, or to expand the chest and draw your shoulders backward in the position commonly assumed when yawning and stretching. Either of these stretching movements will give you an erect position, and you can maintain this thereafter by keeping the head in the right position-chin inward, downward and backward. These stretching movements will be equally effective for improving the carriage when standing. The same complaint that I have made against the ordinary chair can be registered with special force against the desks used in the schoolrooms. 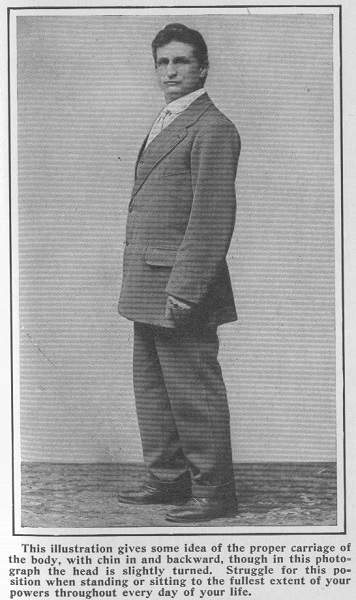 There is no question that a great deal of spinal curvature in childhood, to say nothing of round shoulders and flat chests, are directly the result of the improper sitting posture in the schools which is enforced upon the children because of the unsuitable character of their seating arrangements. Thus we practically begin life hampered by an unsatisfactory environment, so far as our sitting posture is concerned. The chair back or the desk chair should fit the human back. It. should favor and not hamper one in assuming a normal and straight position of the spine. When you get up in the morning, exercise yourself a little in straightening the spine, chin in, downward and backward. When you walk to business or when you go about your duties, keep the same thought in mind. Force the head back. Take the exercises which you will find in the next chapter, referring to the thyroid gland, at very frequent intervals during the day. Remember that in fighting for a straight spine you are fighting for youth and health and life and energy and courage and enthusiasm. You are fighting for everything that is best in life, and you should strive and struggle with all the energy you possess to win the rewards associated therewith. Each day of your life will bring difficulties, worries. Life at its best is not a bed of roses. All these various influences are inclined to make you hang your head. You may have moments when you are hopeless, when life seems forbidding and cheerless. Fight against such inclinations with all the power you possess. Struggle against such discouragements with all your might and main, not only through your mental attitude but through your determination to maintain an erect spine. Hold your head up and look the world in the face. Don't shirk your duty. Don't deviate from the path along which your best impulses and highest ideals would lead you. Life is worth while. It is filled with glorious opportunities. Reach out and grasp them as they come up. Hold your head up and be a man or a woman to the fullest extent of your abilities.